I was contact by Casa Espresso around the same time I bought my Bialetti stove top coffee maker. They have recently expanded their business and they ever so kindly sent me a sample of their beans to try. It's almost like these guys are mind readers! 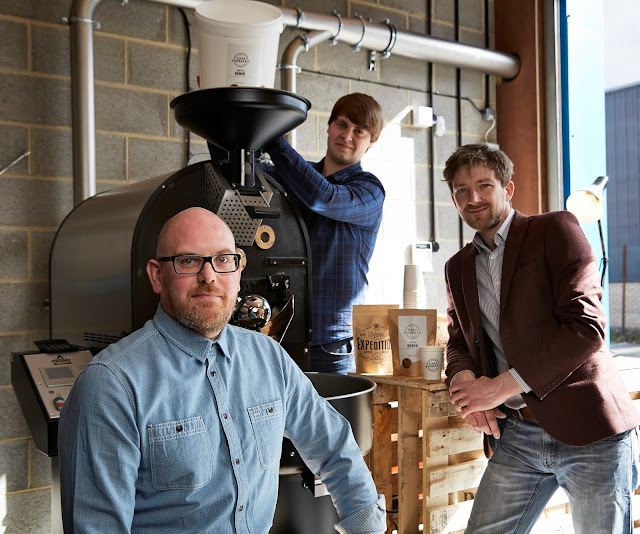 Casa Espresso is the only company in Bradford to roast their own beans to order and they've gone and got themselves some shiny new roasting facilities to help them achieve this. I followed Casa Espresso owner Nino Di Rienzo on twitter and instagram when I moved to Shipley in 2012 as he was a fellow local, I've since moved back to Leeds but it's been interesting to see how his company has progressed over the years. Nino founded the company in 2000 and has supplied luxury coffee makers to suppliers such as Jeannette's Cakery , Primos Gourmet Hot Dogs, Friends of Ham, Moo'd Cereal Bar, The Record Cafe, The Mustard Pot and even La Bottega Milanese. They sell their coffees to order with the roasting taking place on Tuesdays and Wednesdays. Their new speciality coffees include Kenya Ther'i, Nicaragua Samaria, Rwanda Karengara and Ethiopia Kaffe Forest Organic (try saying that three times over). Casa Espresso only roast beans from ethical coffee green importers and are able to track their beans to the individual farmer and village. A good ethos always wins me over. The beans are available in both whole beans and pre-ground 100g wholesale bags and 250g retail bags. I ordered my beans ground to specification for my coffee maker (fine espresso). The coffee which was sent to me was their Espresso Blend 'Unione' (£4.95 for a 250g retail bag and £3 for delivery or free to collect from their site in Shipley). The beans in this blend are 50% Brazil Fazenda Londrina and 50% Rwanda Karengara. Both varieties of beans are grown in high altitudes which gives them a much less earthier taste than those grown below sea level. (You'll see where/how I learnt this in a later post...) Each bag is clearly labelled with its ground date so you know how fresh it is (unlike supermarket brands), this particular bag gives instruction to rest it for a week and then use within 3 months. When I opened the bag I was smacked in the face with a delicious freshly ground coffee smell. Freshly ground coffee (of good quality) is fast becoming one of my favourite smells. I was desperate to try it out in my new stove top. In the Bialetti's instructions it says to not compact the espresso in, however some posts on the web and Amazon reviews alike say that it is fine to do this. I've taken guidance from an expert in coffee who has advised this is a bad idea with this type of coffee maker as it will make the brewing process longer, which will in turn affect the taste and texture of the coffee. I've made a few batches of this coffee and almost emptied the bag, my coffee maker is a bit hit and miss in terms of consistency of the brew. Some come out spot on whilst others are a little scolded or too bitter. I guess it's just a learning curve. However I have to stress that this coffee is worlds above the ground espresso coffee I bought from M&S that I first used with my stove top. I guess this is down to the fact that often it isn't labelled on shop bought coffee when the beans were originally ground and the taste of the coffee depletes with every second/minute/day it is not used. The back of the pack details the flavours you should be able to pick out of the 'naked' espresso aka without milk. Within this blend they are cocoa, raisins and raspberries. My palate for coffee isn't yet refined enough to pick out each of these flavours but I can every so slightly smell the cocoa and taste the sweetness of the raisins/raspberries. Another good feature about the pack, which is absent on my supermarket blend, is that it comes with air holes. This allows you to squeeze out the air which may taint and distort the taste of the ground beans. All in all - these guys know what they're doing.